Well fall is certainly in the air with nighttime temps in the single digits and frost on the dock in the morning! This also signals the back end of our Cap Mouth fishery for chinook. The fishing this week has been a bit slower, but the big fish are finally showing up. Eddie’s guests with a couple of nice sized chinook from Thursday’s trip. We probably have at least another week of decent fishing if more fish continue to show up, as there isn’t much rain in the forecast the next 7 days. We often see fresh fish show up until Oct 15th, so it isn’t over yet. The week after next it looks like it is going to be a wet one and that will push any remaining chinook up the river. As a result, if you want to head out this coming week is likely your best shot at some of the largest chinook we hook all season. 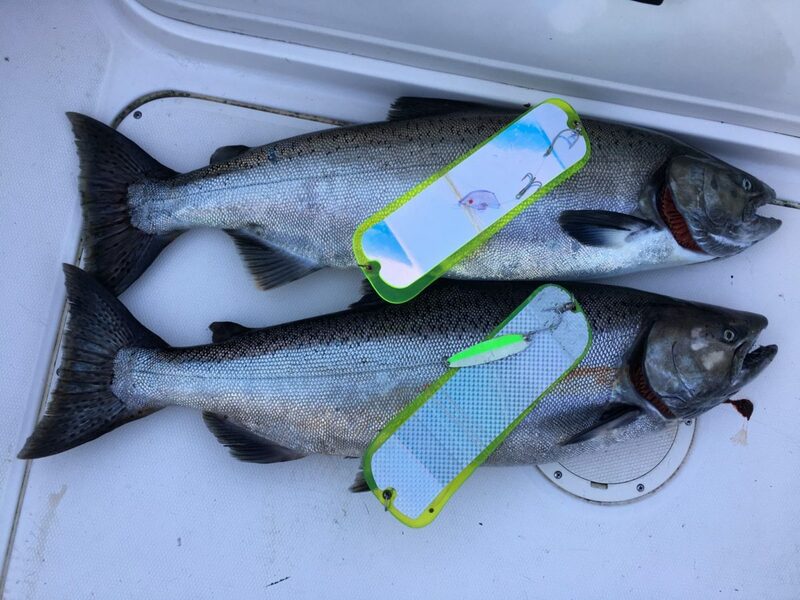 Besides the Cap Mouth, there are opportunities for coho and chum down at the South Arm of the Fraser. Fishing for the coho has been pretty slow these past few days from what I have heard and the test sets at Albion would confirm that with low numbers in the nets. If you look at past data there is usually a decent push of fish around the first and second week of October, so fishing could pick up any day. The chum numbers usually pick up around mid October as well if you want to give that a try. Personally I am looking forward to doing some work on the boats in the coming months and getting out for some winter chinook fishing. In the meantime our guides will be targeting the last of the big chinook to show up at the Cap Mouth and doing some river fishing as well.